Two years ago when we arrived in Zambia, another family arrived about the same time, the Melville's from California. We endured some highs and some real lows together during those first six months and more... They ended up doing jobs they didn't come to do, and it was tough. But they persevered as a family and in the ministry, and were used by God to do a great work in Zambia, setting up our administration end of things for years to come as well as building some key relationships with pastors and church leaders. It was a real cool to see how many Zambians came out to say goodbye. It was really inspirational. 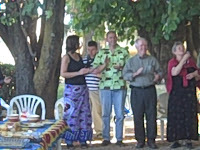 It was very fitting as they sang Zambian songs and shared with the group about the Melville's impact on their lives. It made think about my end and what kind of impact I am having and who would come. (I hope that doesn't sound selfish or self-centered. It was a good thing, like going to your older brother's graduation and having a goal to work towards.) It also was inspiring to keep pressing on because our ministry matters, no matter where we are. We never know the impact we have on people and may never know until Heaven. But, it was sweet to get a little foretaste of that today. The irony of it is that while we may be technically ministering to them, if Graham is at all like me, he would say that he has been more impacted and ministered to by these pastors and leaders than than have by us. Their perseverance in suffering, there commitment to reach Zambia and their zeal to learn and grow have left their indelible markings on our soul. We came to bless and instead are the blessed. So, God bless you and be with you as head back home to California... Hope you enjoy the video... Classic Zambia!